The U.S. Marine Corps became interested in the British-designed Harrier during the Vietnam era. Decads later, the McDonnell Douglas AV-8B Harrier II combines the STOVL (short takeoff/vertical landing) capability of this special warplane with the high-tech prowess of today's "smart" bombs. Not surprisingly, this advanced aircraft was known for a time as the Super Harrier. During Operation Deasert Storm, AV-8B Harrier IIs fought in a "down and dirty" environment with the Marines at the front. One weakness in this advanced aircraft is that its exhaust nozzels are near the center of the airframe, meaning that a hit by a heat-seeking missle is almost certin to be fatal. 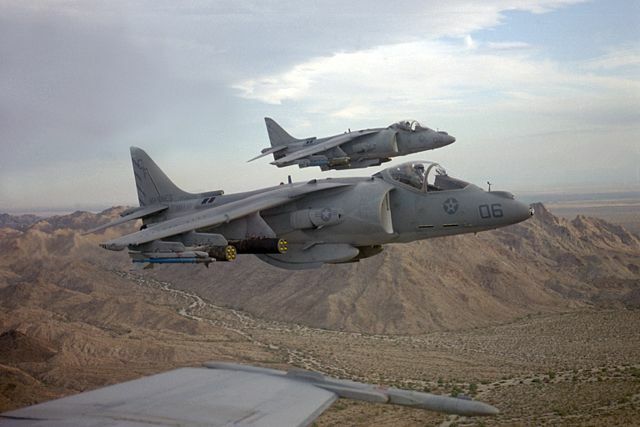 Harriers flew more than 2,000 combat missions and did a great job, but suffered five aircraft lost in combat.